Chili is one of those meals you want to enjoy on a cold, frosty morning. I have countless memories of eating chili especially growing up. And up to this day, I wouldn’t say no to a bowl of chili especially after a tiring day at work. Aside from being a great comfort food during the winter months, chili is so versatile. It can be served with different foods like corn chips, pasta, and salad. And if you are from the Southwest region of the US, you know that chili and bread are inseparable. Thanks to Hormel which started to sell canned beef chili in 1891, countless people around the world have enjoyed homemade chili through the years. 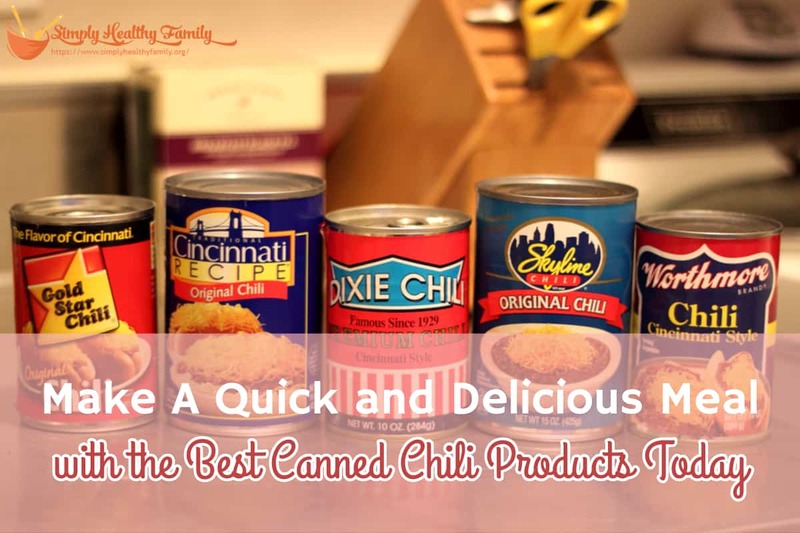 In this post, I’ll share a simple canned chili recipe and then count down the five best canned chili products today. The key ingredient of canned chili is beef. Historically speaking, dried beef has long been used in chili. In fact, there’s a recipe dating back to the 18th century which describes the dish as consisting of dried beef, chili peppers, and salt. Canned chili typically has beans. For many people like me, chili isn’t chili until it is mixed with beans. Some even call chili without beans as a simply meat sauce. This only goes to show how much we love chili and beans. Onion is another ingredient you’ll typically find in canned chili. Like garlic, onion is often added to chili to maximize its flavor. Other ingredients you will also find in canned chili are bell peppers, tomatoes, black pepper, green chilies, and spices. Canned foods have a bad reputation for being unhealthy. While I would always prefer homemade food instead of canned food, I know that a lot of us are too busy with work that we don’t really have a choice but to eat canned foods from time to time. I won’t say that canned chili is nutritious, but it has some redeeming value as far as nutrition is concerned. For one, it is an excellent source of fiber thanks to the incorporation of beans. In fact, canned chili can provide up to 45 percent of the required daily value of fiber. It is also a good source of vitamin A which promotes a healthy immune system. Vitamin A can also support bone growth and reproduction as well as good eyesight. A typical canned chili can provide up to 30 percent of the recommended daily value of said vitamin. You can also get iron from the canned chili. Iron is a mineral that plays a crucial role in red blood cell production. Lack of this mineral can lead to conditions like anemia. Canned chili can give you up to 15 percent of the recommended daily value for iron. If there’s one thing that canned chili is notorious for, then it would be its high levels of sodium. But there’s a remedy to that. You can add more corn, beans, potatoes or even chopped vegetables to the chili recipe to slash the sodium content of the canned chili. Canned chili is one of those products busy moms should be thankful for. With it, they can come up with a quick and delicious dinner after a long day in the office. Here is a simple canned chili recipe that you can cook in less than an hour. It may sound too long to prepare but don’t worry as 30 minutes will be spent letting the food simmer so that you can attend to other pressing matters at home. Put the beef into a soup pot placed over medium heat. Cook and stir until the meat has turned brownish. Break it up into crumbles and cook for 10 minutes. Stir in the garlic and onion. Cook for 5 more minutes or until the onion has turned translucent. Drain the excess grease. Sprinkle the meat with the taco seasoning mix. Cook the meat with the seasoning for another minute or so. Pour the chili-flavored tomatoes, diced green chilies, chili beans and tomato sauce. Stir to combine then let it simmer for 30 minutes. This is the canned chili that I would recommend if you prefer canned chili that’s flavorful but not spicy. This vegan chili has a sweet taste with some hints of spiciness, but not too much to offend you. It comes from a family-owned company that grows organic foods. As such, this canned chili contains organic ingredients such as onions, black beans, tomatoes, bell peppers, and green chilies. I’ve tasted this product before, and I can vouch for its taste. The chili is very tasty coming from the can. You will also notice that the beans have a good consistency. And the sauce may not be as thick as tomato paste or as thin as soup broth, but it is very delicious. Now, this is the canned chili that I would recommend if you like chunky and meaty chili. I’ve always loved Campbell’s chili because they don’t scrimp on meat, and this one is no exception. The sauce also tastes great. It isn’t that spicy, too, which makes it a good choice for people who love chili but prefer a mild-tasting one. In case you want to enhance its flavor, you can add chili powder or even Mexican spice flavorings. But as a standalone meal, this is delicious enough for most people. You can also eat this as a post-workout meal. There are only about 240 calories per serving thus you shouldn’t be worried about your caloric intake with this canned chili. This is definitely hotter and spicier compared to the two previous canned chili products. Of course, spiciness is relative--- what may be hot for you may not be hot for me. I’ve tasted it once, and if my estimate is correct, its spiciness can be described as that of a Jalapeno. You don’t need a can opener as this can feature a pull back tab. This makes the can easy to open. It’s teeming with beans. I guess that more than half of the can contains beans. There isn’t a lot of meat in the can, but at least the meat is very chunky. This chili is made with chunks of juicy beef, tomatoes, jalapeno peppers, and onions. Its spiciness is comparable with that of the previous canned chili. Many of those who have tasted this canned chili say that this is by far the closest to good ole homemade chili they’ve had out of a can. I find this chili a bit watery for use on hotdogs as well as chili cheese fries. However, you can try to remedy that by trying any of these remedies. But if you’re looking for a quick dinner or snack, then this isn’t a bad choice at all. This is canned chili that you can use in making nachos or if you’re scrambling to have something to eat for dinner. One big plus of this product is that it is gluten-free. Thus this is one canned chili you would want to have if you have celiac disease. In my book, this is the canned chili that closely resembles the taste of homemade chili. I usually use it as a base for my chili recipes. You can also add other ingredients like chili pepper, ground meat, and tomatoes. These are five canned chilies that have been getting a lot of positive reviews online. It’s really hard for me to pick which is the best in this list; however, by experience, the Hormel Chunky Chili with Beans really has the taste that is closest to homemade chili. Still, I would encourage you to try the other canned chili products I mentioned in this review. And let us know what you think of these products by writing in your thoughts in the comments section below.